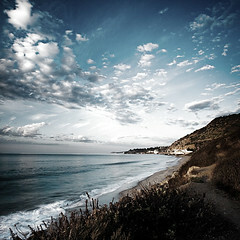 Photo by Flickr user imagebysp, used under Creative Commons license. An event like no other, the Surfrider Foundation’s Celebrity Expression Session allows celebrities to show off their surfing skills and moves in a free surf format. In addition, celebrities can win prizes for every wave they catch and ride courtesy of Project Blue, a collective between six of the surf industry’s top brands to raise funds aimed at supporting the Surfrider Foundation. Celebrities taking part in the surf session include Jason Mraz, Flea, Sal Masekela, Peter DiStefano, Chad Lowe, Richard Burgi, Brandon Cruz and David Chokachi. They may be playing a little loose with the definition of “celebrity,” but I’d love to see Flea in the water. The MSA Classic takes place at Surfrider Beach and events are free of charge and open to the public. Early rounds begin on Saturday, September 6th and run through Sunday, September 7th.